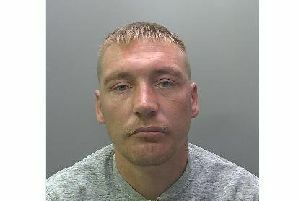 A Peterborough man who stabbed three people including his ex-girlfriend and her family has been jailed for 16 years. Caleston Jones, 22, was arrested on 3 October last year (2017) after committing a string of offences, including stabbing three people. Two days earlier, on the evening of 1 October police received a call for assistance from the ambulance service who were tending to a man and a woman who had both been injured in Welbourne, Peterborough. The man had been stabbed five times and the woman, Jones’ ex-girlfriend’s mum, had been caught up in the violence and was also seriously injured. The pair had gone round to the house in Welbourne to collect some keys and an argument started between them all. Following the incident Jones, of no known address, evaded police, but was arrested in a taxi on the A1M near Sawtry after attempting to flee the county. Not long before his arrested he had stabbed his ex-partner in the arm after she refused to run away with him. Officers were also informed of other incidents involving Jones’ ex-partner where he caused damage to her home and assaulted her on another occasion. Jones pleaded guilty to common assault, causing damage to property, causing grievous bodily harm (GBH) with intent and two counts of assault causing actual bodily harm (ABH) at a hearing. On Friday (8 June) he appeared at Cambridge Crown Court and was sentenced to a total of 16 years in prison; four months for common assault, two months for damage to property, 16 years for GBH, 12 months of one of the ABH and two years for the other ABH, all to run concurrently.